This evening, I received my Bella cup. I was so excited because I had heard so many great things about this particular cup. THANK YOU Bella for sending me your cup to try out and review. If you go to the Bella website: http://www.bellacup.co.kr/ you will find a beautiful color scheme and a simple and easy to follow layout. 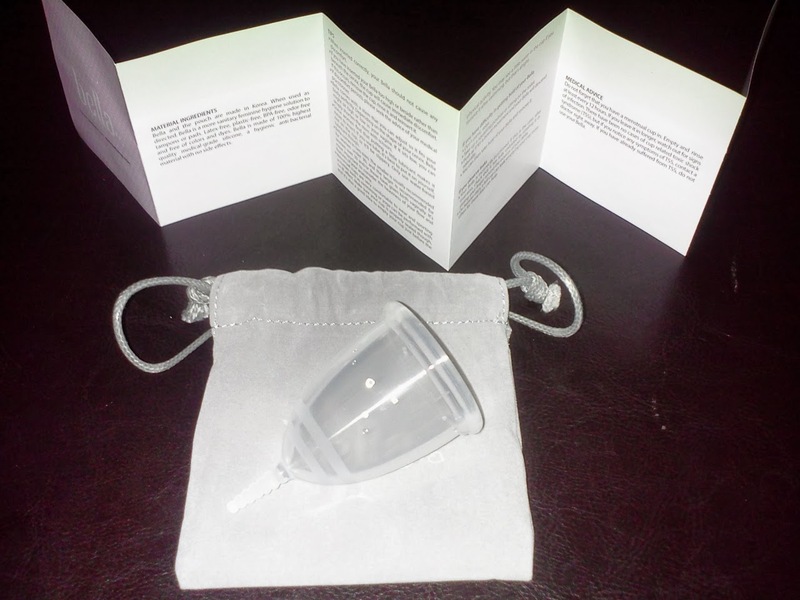 You will also see the benefits of using a Bella cup over disposable tampons and pads. Overall, I think their website is useful and user friendly. This cup hails all the way from Korea. It traveled a long way to my California home, including a stop at Customs. :) I think their packaging is really pretty. It follows the same color scheme as you find on the website. 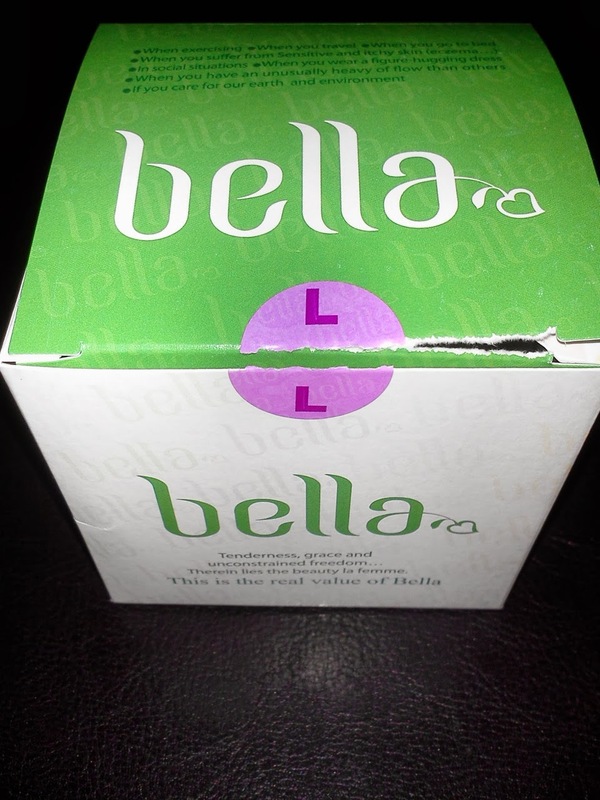 The small green and peach box includes the brand name, Bella in several colors on the side of the box. They put a seal sticker with the size name on the opening of the box to be sure that the box hasn't been opened after it was boxed. Also, the box is recyclable! That is a bonus since one of the many benefits to women using menstrual cups is lessening the impact we have on the environment. 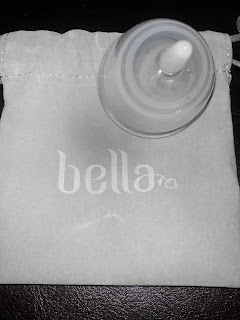 When I ordered my Bella cup, I was given the option between small or large & gray pouch or green pouch. Obviously, I chose a large cup and a gray pouch. If you've read my blog, you'll know that the pouch is one of the things I look forward. I'm a girl, what do you expect? I think it's an important accessory to the cup because it is what is going to keep it clean in my purse. Okay, back on track. 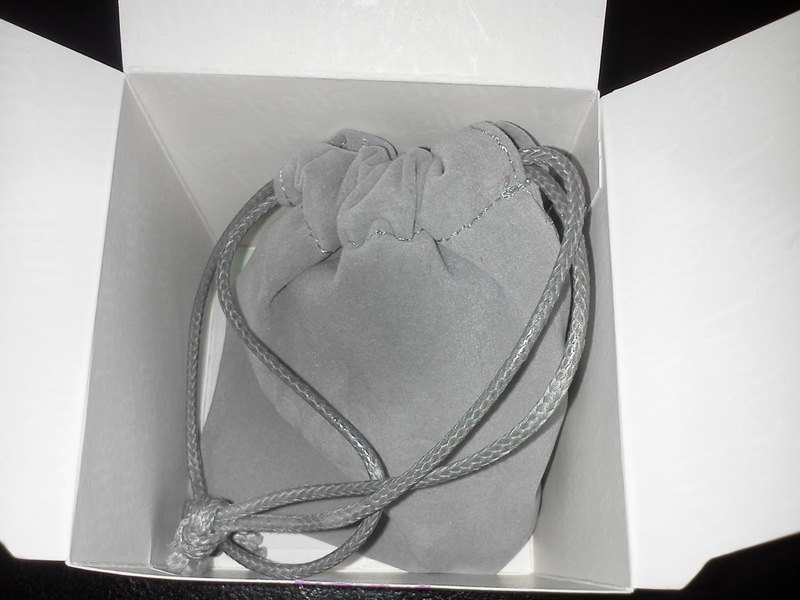 I ordered the gray pouch, it's light gray. What's interesting about this pouch is it's unconventional material. This pouch is made of a thick, suede material with the word Bella embossed on one side. At first glance, I really like the clean, simple presentation of the Bella brand. Even the cup has the same simple, streamlined design. I love that. I think the best word to describe it would be, understated. The cup... lets talk about the cup. My favorite thing about the Bella cup is the fact that the inside of it doesn't have any raised writing in it. This is something I particularly love because it makes it easier to keep the cup clean. 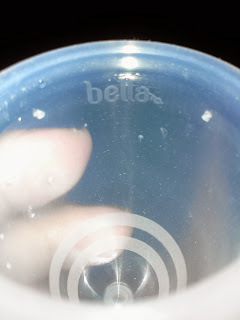 There is writing (the word bella) inside of the cup but it is embossed, not raised. There are no measurement lines inside but the website states that the large Bella can hold 30 ml of menstrual fluid. That translates to 1 fluid ounce. I would call that a high capacity cup. Which is great for me! This is a very soft cup. I love the feel of it it's so squishy and to me, that means it's going to be super comfortable. The only issue is that I have a hard time getting really soft cups to pop open once inserted. Quite honestly, this is one of the hardest cups for me to get to create a seal inside of me. It took quite a bit of negotiating and maneuvering before I was able to create a good seal that I was confident about. Once the cup is in, it is very comfortable! What I've learned about my anatomy is that I can wear any cup. My body isn't super finicky in that way. So, the determining factor in me choosing a cup, or my favorite cup for that matter is going to be ease of insertion. The only thing that would keep this cup from being my favorite would be how difficult it was for me to get it to pop open. I know several people who prefer a softer cup and I'm sure this would be a non-issue for them. The cup has four holes towards to top of the cup, two one either side of the cup. This allows for maximum capacity. The holes are small so the way I get them clean is to fill the cup with hot water, hold my hand covering the top and squeeze so the water squirts out through the holes. I do this until the holes are clear and clean. At the bottom of the cup, there are no grip lines. There are only embossed lines with a little bit of texture. This might make removal challenging for someone who cuts the stem completely off but it will not make it impossible. The Bella's stem is unlike any other stem I've seen. It has the same embossed texture as you'll see throughout the cup but it is also bubbly (the best word I can think of). The stem itself looks like a bunch of bubbles stacked on top of each other. IF you kept the stem on, it is quite helpful for removal. The stem also has some stretch to it. Since the stem is so pliable, even if the stem sticks out a bit it will still be comfortable. During my trial, I slept all night with the Bella. I was able to sleep 6 hours without getting up to empty. Due to my heavy flow, I normally get up 3 to 4 times a night to empty, rinse, and reinsert. This is a major bonus for the Bella brand. Me being able to sleep for 6 hours made me an automatic fan of the Bella cup even if I know this isn't my soul mate cup. I would recommend this cup to anyone who prefers a soft cup with a high capacity. I would not recommend this as someone's first cup, simply because it was a challenge for me to get it to pop open and seal properly and I am more experienced than someone trying a cup for the first time. 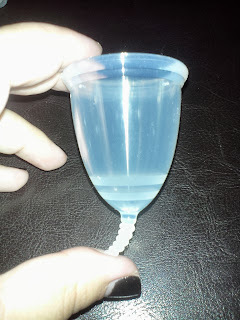 After using the Bella cup, I've learned that for my anatomy and cycle, I really need a firmer cup. That does NOT mean that this isn't a great cup, it just isn't my ideal cup. With that said, I see a LOT of positive things about this cup that would make is a wonderful, comfortable cup for someone. Overall, I would give the Bella cup 7 out of 10 stars. My top 3 favorite things about this cup are: the capacity, the stem, and the fact that the writing on the inside of the cup is embossed which makes for easy rinsing and cleaning. If you have any questions regarding the Bella cup, please email me at periodbloggy@gmail.com. I am not sponsored by any of the menstrual cup companies that I write about.